Behind the Undead Parish, surrounded by forest and wildlife, the Sen's Fortress was constructed, to serve as a test for those who wish to enter the City of the Gods, Anor Londo. Filled not only with swinging blades, pressure plates, traps and deadly boulders, Serpent Men and Prowling Demons lurk behind every corner. After ringing the Bells of Awakening, one of the enslaved Giants open the gates. Two other Giants can be found on the rooftops; one of them loads boulders into a machine that sends them rolling throughout the fortress, while another one throws explosives at whoever trespasses. In order to finally reach Anor Londo, a tired warrior will need to fight the last guardian of the Fortress, the gatekeeper Iron Golem, that has repelled and slayed countless heroes and was created by the Gods of Anor Londo by fusing the power of a soul with the bones of the dragons, forming a core for this monstrosity made of steel. 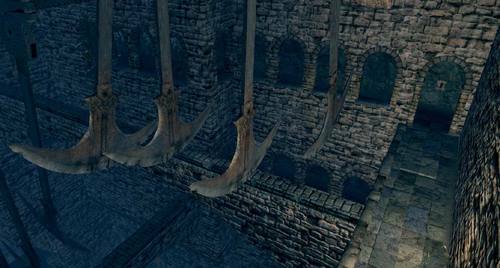 Once the Iron Golem is defeated, the gate to Anor Londo will be found blocked, but three Bat Wing demons transport whoever gets this far. Heroes and warriors from different eras have tried to reach Anor Londo. While some have succeeded, like the knight of Berenike Knight called Black Iron Tarkus or the Sunlight adherent Solaire of Astora, many others have failed, such as a considerable amount of Berenike knights, Balder knights, Balder's King, Knight King Rendal; legendary sorcerers such as Big Hat Logan, who ended trapped in a cage, or royalty knights gone hollow such as Prince Ricard. Others have lost hope, like the Crestfallen Merchant or Siegmeyer of Catarina. 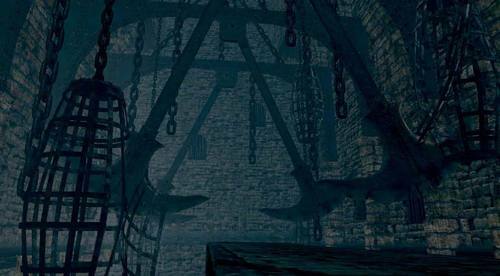 Miyazaki: After ringing the bells and overcoming the traps of Sen's Fortress I really wanted to player to feel "Yes! I've made it!" Miyazaki: Sen's Fortress and Anor Londo were both overseen by Mr. Waragai. As for me, I had a definite visual image right from the beginning and a concept behind the area i.e. the trial to reach Anor Londo, full of deadly traps. The designers had real trouble with this area, I seem to remember. We spent a long time on the rough map. Waragai: The image of a trap road was fairly straightforward. The pendulums, rolling boulders and other major traps were all there from the start. In fact, we almost tried hard to make them obvious and create things that screamed "trap!". Miyazaki: It's almost comical how obvious they are, but I think things like that are all part of Dark Souls' appeal. Personally I love the stone launcher, the way it endlessly fires the boulders, and the strange complex contraption build to achieve this simple action. It's things like this really add a sense of intrigue to the Dark Souls world. In terms of achieving the original design aims, I think the area works really well. Satake: I really like the way the stairs are worn away where the boulders roll down. Waragai: I think that was Miyazaki's idea. Waragai: Yes, the idea was that the worn steps might give players a warning as to the dangers ahead. Miyazaki: I see, although I doubt people would be able to pick up that on that small detail, especially on their first time through. Perhaps the second time, it will serve to remind them. Waragai: Diligent people will notice I think, by that point you've already seen several large boulders. Miyazaki: I'm glad we were able to create a design that really incorporated all of our ideas. Of course, most fools can't even find their way into that fortified deathtrap. An Axe born from the soul of the Iron Golem, guardian of Sen's Fortress who repelled countless heroes who sought Anor Londo. The Gods fused the power of the soul with the great bones of the dragons, forming an appropriate core for the giant golem.